The monkey fist knot is another way of making a fire head. The spherical shape give the best volume to surface ratio when using an adsorbent core. However the knot should have a rigid core inserted within to keep the knot from flexing and coming undone. A non flexing anchor should be used to attach the chains to the core as this prevents friction against the rope edges, however wick can be additionally protected with some PVA (white school glue). 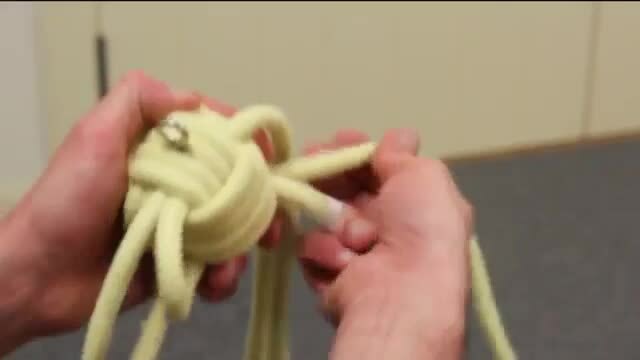 "How to make a MONKEY FIST knot" was first uploaded by HOP and has been viewed 203156 times. How do I secure the cut ends to the core? Using the keywords [make monkey fist knot] we found the following similar topics.